The Youth Author Lunch on Friday included an opportunity to discuss with a panel of WNDB personnel, Dhonielle Clayton, Lamar Giles, Caroline Richmond, Olugbemisola Rhuday-Perkovich, and Juleah del Rosario. We had a full house including great conversations at individual tables, a lovely lunch, and a lot of information about changes in diversity in the publishing industry. The panel started by going over the history of We Need Diverse Books. 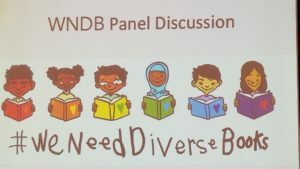 The first wave of activity after the birth of the #WNDB hashtag and movement involved publishers looking at authors and illustrators writing outside their lane to provide “fixes for the problem.” Fortunately, most now embrace the #ownvoices movement. In addition, many books written by POC and other #ownvoices are finding spots on bestseller lists. As Lamar Giles notes, that is not because these authors went from bad to good overnight. Its because the authors and books are finally being taken seriously by publishers, and getting the marketing and publicity push behind them to propel them into visibility. Diverse books by diverse authors are no longer being shoved into a pigeon hole to die, quietly and unnoticed. Once these books are discovered by readers and reviewers, the quality that was always there is seen. Sponsoring numerous diverse interns into large publishing houses. Publishers often hire from pools of unpaid interns, and many authors from marginalized populations found in difficult to afford to take on an unpaid job in the very expensive land of New York. In the last few years, several of the interns subsidized by WNDB have gone on to permanent employment in publishing. The Walter Awards celebrating diverse books by diverse authors. Short story anthologies of diverse authors designed to be school-friendly. Each anthology includes a slot reserved for an unpublished author to help undiscovered #ownvoices get a start. Copies of the anthologies, Walter award winners, and other books are regularly given away to classrooms across the country. And several participants at the luncheon went home with autographed copies of several of the books involved in the giveaway. Created an Our Story app as an easy-to-use resource for students, teachers, and librarians to help find diverse books of interest. The app includes a quiz readers can take to help the app suggest books for them. That includes so-called reluctant reader who may simply not have found a book that speaks to them…yet. During the Q&A period, several questions about the self-publishing surge came up. The panelists felt self-publishing was more a band-aid than a solution to the problem of getting more diverse books published and into libraries. They advocate for actions that will help fix institutional problems, such as the internship program. While self-publishing is now a viable publication path for authors to pursue, it should not absolve publishers from dealing with real issues that remain in the publishing industry.